Chocolate is high in calories, sugar, and fat. And eating a lot of it will cause weight gain. But a little chocolate may actually provide some health benefits. A general opinion from many is that if you eat a bar of chocolate every day, you have to accept that you are going to get fat. 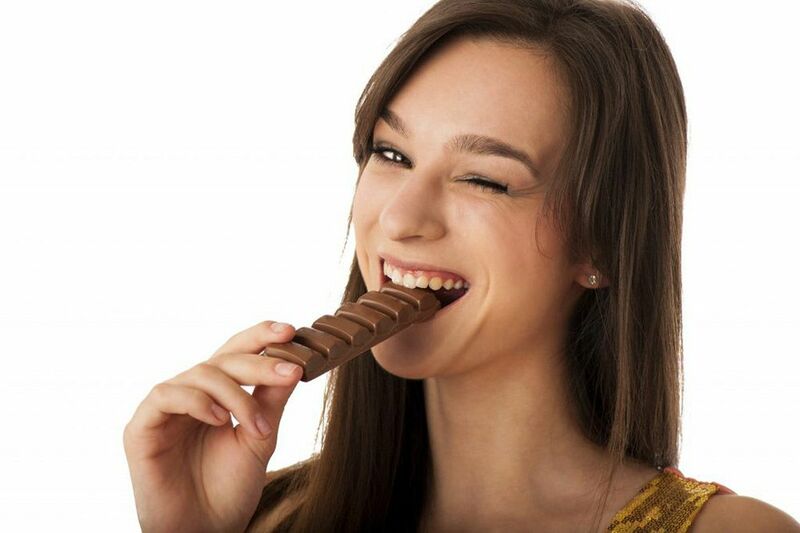 Eating chocolate less frequently or in smaller amounts can help to reduce its impact on your weight. When craving chocolate, another way to indulge your sweet tooth without boosting your body fat is to reach for sweet, filling, high-fiber fruits instead, such as pears. If you simply can’t do without your regular chocolate fix, another way to reduce its impact on your weight is to increase your physical activity level and devoting enough time in exercise. It is always said that if you are stressed and your mood is off, better to eat Chocolates as it not only taste good but also contains several chemicals which makes you happy and lit your mood. Scientifically, there are over 100 of naturally occurring chemicals in chocolate, and some of them can affect the human brain via the release of particular neurotransmitters. Neurotransmitters send signals back and forth between neurons. Certain neurotransmitters can be responsible for your emotions and the way you feel that after eating in a while. eating chocolate releases endorphins into the brain. Endorphins are known to decrease levels of both stress and pain. When we eat chocolate, it releases several neurotransmitters that have positive effects on human feelings. One of these is phenylethlyamine, which causes alertness and creates degree of excitement in your mind, quickens the pulse rate, and makes you happy. Phenylethylamine is sometimes called “the love drug”, because it arouses feelings similar to those that occur when one is in love. Another neurotransmitter, serotonin, is a mood lifter, as well. One chemical that causes the release of serotonin into the brain is tryptophan, found in chocolate. Health benefits of dark chocolate: It contain flavonoids which act as antioxidants. This flavonoids protect our body from free radicals and also lower our blood pressure and reduce LDL cholesterol. Health benefits of dark chocolate: It absorb UV light, improves the flow of blood in the skin, increase skin density and hydration. Health benefits of dark chocolate: It in the production of endorphins, chemicals in the brain that bring the feelings of pleasure. It may protect our brain after a stroke by increasing cellular signals that shield nerve cells from damage. Also it serotonin, which acts as an anti-depressant. Just seeing chocolate, or inhaling its wonderful aroma, has quickened the beat of many a chocolate-lover’s heart.